Many observers have now come out against statutory underpinning of a new press regulator, having largely kept quiet on the subject during the Leveson Inquiry (which was itself a form of state intervention in the press). Yet most of them insist they support the rest of the “Leveson principles”. Forget about making any such concessions. The dangers Lord Justice Leveson’s report poses to press freedom do not end with statutory underpinning. His “principles” amount to demand for the effective licensing, sanitising and further restricting of a free press. Here are just some of the Leveson proposals that should be rejected along with statutory underpinning. The Leveson report insists that the new regulatory board must be “independent” of the press and politicians to achieve a system of “independent self-regulation”. You do not need a law degree to see that as a contradiction in terms. If a regulator is “independent” of the press, it is an external policeman. That cannot be “self-regulation” by any normal standard. In any case, what will the new body really be independent of? Unless they are to be angels summoned from above, everybody sitting on it will have earthly interests and agendas of their own. The likelihood is that Leveson’s new regulatory board would be stocked with the same class of the Great and Good who sat as Leveson’s advisors – knights, media grandees, hackademics, retired police chiefs and the like, none of them with much time for popular newspapers and dirt-digging journalism. These people would have to power to rewrite the journalists’ code, define what is in the “Public Interest”, investigate newspapers they deem to have broken the rules and fine them up to £1m. Leveson proposes that a “recognition body” be empowered in law to check that the regulators are doing their job. He says that role should be played by Ofcom, which could also act as a “backstop regulator” if the new system falls short. The last thing our raucous press needs is to be overseen by the broadcasting quango, stuffed with government appointees, whose aim appears to be to turn the BBC into the Bland Broadcasting Corporation. Labour’s alternative proposal, that the regulator be overseen by the Lord Chief Justice, is no better. Unelected, unaccountable judges already have far too much power to interfere with the press. Leveson’s report claims to offer incentives to newspapers to sign up to the new regulatory body – in particular a low-cost arbitration system that could save them big court costs, and a “kitemark for use by members to establish a recognised brand of trusted journalism”. These have been described by Leveson’s cheerleaders as carrots, not sticks. If so it is a carrot shaped like a baseball bat with a six-inch nail through the end of it. This is effectively a new form of official licensing of the press. Those who decline the invitation ‘voluntarily’ to sign up to the new system would be threatened with having to pay ‘exemplary’ damages and “one-way costs” if they were taken to court. That looks like an indirect form of taxation on dissident newspapers – exactly 300 years since the Crown first taxed the newly unlicensed press in 1712, to try to stop the masses reading about what their rulers were up to. The notion of a kite mark for a ‘recognised brand of trusted journalism’ ought immediately to raise the questions: ‘recognised’ by who? ‘Trusted’ by who? Much of the evidence to the Leveson Inquiry dripped with fear and loathing of the popular press, and that prejudice is clear between the lines of the report. It is not hard to imagine what view the new regulators might take of ‘good’ journalism. Their kitemark would be a form of ‘ethical’ licensing, a badge of conformism. After all, what such marks usually tell us is ‘this product is safe and child-friendly’. None of the rule-breaking convention-busting heroes of the historic struggle for a free press in Britain, such as John Wilkes in the eighteenth century or WT Stead in the nineteenth, would have qualified for any such kite mark, and were all the better for it. One legitimate criticism of the press has been a reluctance to publish corrections and apologies swiftly and prominently enough. Leveson’s proposed ‘independent’ arbitration body would use that as an excuse to throw the press open to anybody with an axe to grind or a taste for self-publicity. The arbitrator would hear complaints, not only from individuals alleging mistreatment, but from ‘representative groups’ and third parties who don’t like something they have seen or read. Expect a weekly list of complaints from lobby groups, crusaders and the Society of Black Lawyers. If the judge-figure on the arbitration body sides with the complainant, the regulator will then have the power not only to order the publication of a correction or apology, but to determine how and where it should be printed in the paper. Are the front pages of our newspapers to be edited by judges rather than journalists in future? The Leveson report is big on “transparency” as a way of countering what it sees as the questionable relationships between journalists and the police in the past. Yet its proposals are likely to leave the public in the dark about more that the police are doing. For example, Leveson wants to end the practice of “off-the-record briefings” – a key tool in helping both crime reporters and the police do their jobs. The alternative will not be more information coming out of the state, but far less. He says that police commanders should inform officers of “the dangers of consuming alcohol in a setting of casual hospitality”, though he does not specify what the drinking-and-briefing limit might be. And he wants a bar on news outlets naming suspects or people who have been arrested. There have been many cases where the press identifying arrested suspects has been crucial both to informing the public, aiding the investigation, and keeping justice open. The end result of all this institutionalised mistrust could only be to make the state more secretive. 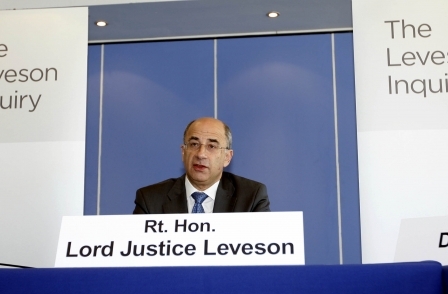 Leveson claims to want to protect investigative journalism ‘in the public interest’. Yet his proposals threaten to put investigative reporters in the dock and make it even harder to get at the hidden truth. He wants to change the 1998 Data Protection Act to give journalists less protection when acquiring information through backdoor methods – and suggests that those who break the tightened rules should be jailed for up to 2 years. Leveson also suggests that the 1984 Police and Criminal Evidence Act should be amended to give less protection to journalists’ confidential sources of information, removing the ‘journalistic exemption’ for material that has been ‘stolen’ – which would mean most leaked information – and let the police or even the Financial Services Authority go into newspaper offices and seize it. Leveson and his supporters claim to approve of the Daily Telegraph’s exposure of the MPs’ expenses scandal as ‘public interest journalism’. Yet under his proposal the paper would presumably have had to hand over the leaked/stolen disks containing that information, and turn in the mole to the cops. Leveson also wants the press’s relations with politicians to be far more “transparent” than in the past. Thus he proposes that political leaders, government ministers and shadow ministers and their “agents” should all be required to publish details of their meetings with the press, and a “fair and relatively complete picture” of their correspondence, phone calls, texts, emails etc. Although Leveson insists that he does not wish to interfere with ‘normal’ lobby journalism, the message that off-the-record briefings are suspect could be disastrous for political reporting. If politicians feel that they can effectively speak only on the record, it will mean that they talk even more in scripted sound bites. What is more, it seems the new unelected press regulator will also be tasked with holding our elected leaders to account. And there was I thinking that was the voters’ responsibility in a democracy. One proposal that might look appealing is that Leveson’s law would also give the UK government an explicit duty to uphold and protect the freedom of the press. Yet this looks more akin to giving the fox the legal responsibility for ensuring the upkeep of the chicken coop. There is a striking difference between Leveson’s proposed protection and the First Amendment to the US Constitution. The Lord Justice suggests, in his usual wordy style, that it will be lawful to interfere with the media ‘insofar as it is for a legitimate purpose and is necessary in a democratic society’, thus leaving the door open for further state intervention. By contrast the short and sweet First Amendment states that it is illegal for the US Congress to pass any law ‘abridging the freedom speech or of the press’. In other words, it is never ‘legitimate’ or ‘necessary in a democratic society’. If Lord Justice Leveson’s almost-one-million word report had instead echoed those few words, we would be far better off now.